As far as summer destinations in Pennsylvania go, Raystown Lake in Huntingdon County, Pennsylvania, is just about perfect. 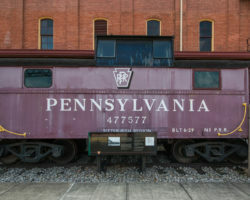 In fact, it’s one of my favorite counties in Pennsylvania for outdoor activities. Raystown Lake is over 8,000 acres in size and has 118 miles of shoreline, making it the largest lake that’s entirely in Pennsylvania. That makes the lake home to some of the best fishing and recreation opportunities in the state. However, with upwards of 98% of the lake’s shoreline undeveloped, fully enjoying the beauty and remoteness of the lake is quite difficult if you don’t have your own boat. 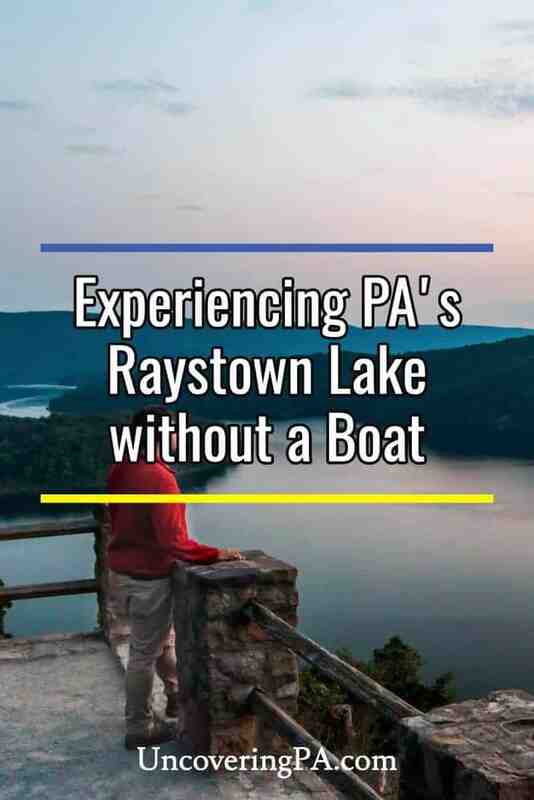 Fortunately, though, there are many great ways to enjoy Raystown Lake without your own watercraft. There are several great public access points for fishing and swimming, including this fishing pier at Aitch. 98% of Raystown Lake’s shoreline might be forested, but they cram a lot of great things in that remaining 2%. For those without a boat, the best public access areas are Seven Points Recreation Area, Aitch, and Tatman Run. 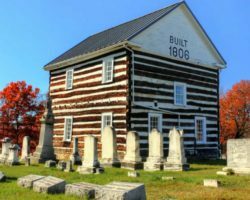 At Seven Points Recreation Area, the closest of the three to downtown Huntingdon, there is a large campground, a beach for swimming, the Raystown Lake Region Visitor Center, and hiking trails. A bit further downstream, tucked back in a cove, is Aitch. 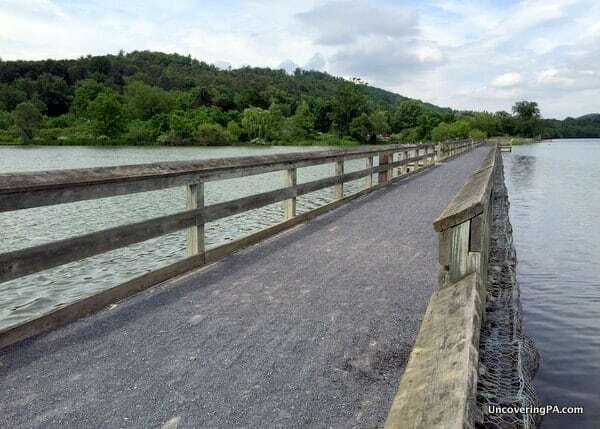 Here, an old railroad bed has been transformed into a fantastic fishing pier. It is also a great place for birdwatching, as much of the surrounding area is a dedicated nesting area for birds. Another great option is Tatman Run. 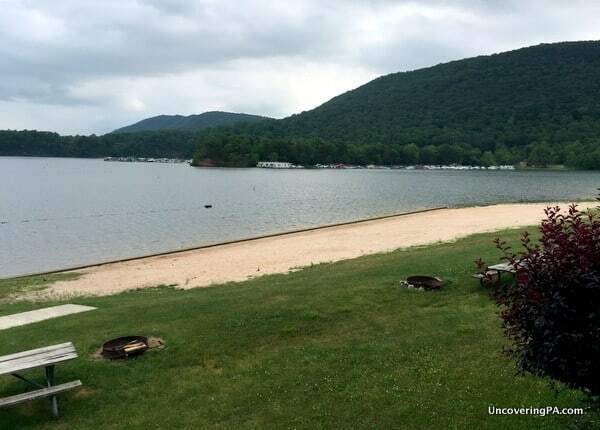 Almost directly across Route 994 from Lake Raystown Resort and just a few miles from Trough Creek State Park, this area offers a second swimming beach and picnic pavilions. For those that want to get out on the water, but don’t have their own boat, there are two fairly inexpensive options. 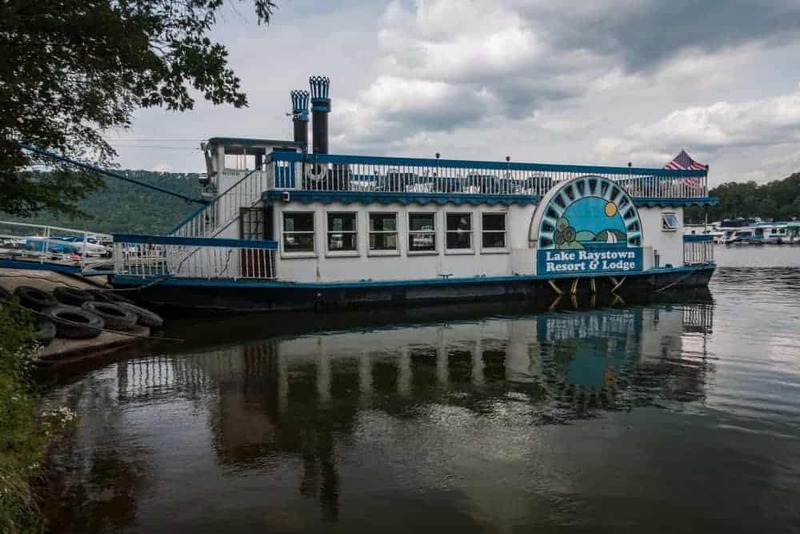 Both Lake Raystown Resort and Seven Points Marina offer sight-seeing cruises that will give you a ride along the lake while giving you a bit of history about the area. Lake Raystown Resort runs the Proud Mary Showboat. The boat leaves every afternoon from Memorial Day to Labor Day on its 90 minute cruise around the southern portion of the lake. The boat also has a second, themed cruise most days of the week. From Seven Points Marina, The Princess leaves on sight-seeing cruises Saturdays and Sundays from Memorial Day to mid-October, and on Tuesdays and Thursdays from mid-June through mid-August. This two-hour cruise takes you along the northern part of the lake and all the way up to the lake’s dam. The Princess also offers themed cruises on various days during the cruising season. What’s great about both of these cruises is that they give you the chance to see different parts of the lake, so why not take them both?! Hawn’s Overlook at Raystown Lake is one of the best I’ve seen in Pennsylvania. The mountains around Raystown Lake might make it hard to develop, but it also creates some amazing overlooks. Honestly, I haven’t see many in Pennsylvania that rival the overlooks at Raystown Lake. One great area is Ridenour and Hawn’s Overlooks at the northern end of the lake. These two overlooks are separated by about 400 yards, and offer amazing views looking both north towards the dam and south. This overlook area is a must-see area for anyone visiting the lake. A foggy morning at Ridenour Overlook. Another great overlook is from the back deck of the Raystown Lake Visitor Center. This view, which is on a hillside above Seven Points Marina, offers a commanding view of the lake, with the added benefit of having the marina in the foreground. The visitor center also has a great museum for those wanting to learn more about the history of the lake and the region. Relaxing at Lake Raystown Resort is a great way to enjoy life on the lake. One issue with the lack of development around the lake is the shortage of lakefront accommodation options. Fortunately, there’s Lake Raystown Resort. Lake Raystown Resort offers every imaginable type of accommodation, from campsites to hotel suites, as well as tons of great amenities. For those looking to spend some time on Raystown Lake without a boat, the resort offers swimming and fishing opportunities right from shore, as well as many places to simply relax and watch lake life go by. You can read read guest reviews of the resort on TripAdvisor [Affiliate Link]. There are many great hiking and biking trails near Raystown Lake, including this one in Trough Creek State Park. Whether you love hiking or mountain biking, Raystown Lake is a fantastic destination. All along the lake are trails that offer breathtaking scenery of the area surrounding the lake, and even a few vantage points that can’t be reached by car. 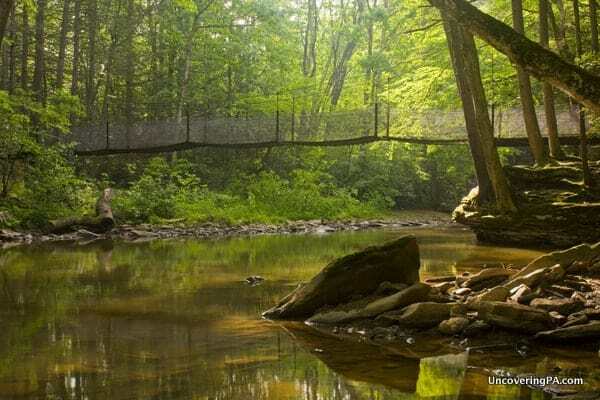 One of the most popular areas for hikers is Trough Creek State Park. Located along the eastern shore of the lake, this park has several great hiking trails for those looking for a short hike. Features of the trail include unique rocks, a waterfall, and several cool bridges. Another popular trail on the eastern side of the lake is the 18-mile Terrace Mountain Trail. 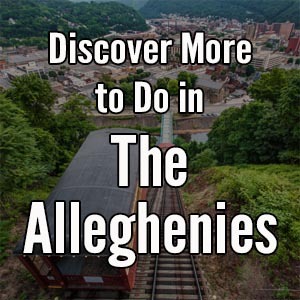 This trail runs most of the length of the lake and traverses some of the most secluded sections of the Alleghenies. This trail is open to hikers or mountain bikers and is a great choice for a long day or overnight hike. 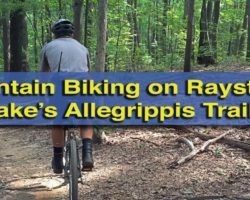 Mountain bikers flock to Raystown Lake each year to ride the Allegripis Trails on the lake’s western shores. Featuring 36 miles of dedicated mountain biking trails, this is one of the best places in the state to ride. While it might not offer many lake views, it does give you the chance to experience the nature and beauty of the area around Raystown Lake. Note: My stay at Raystown Lake was hosted by the Huntingdon County Visitor Bureau and Lake Raystown Resort. However, the suggestions mentioned here are my own. Are you a museum lover? 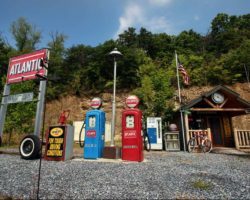 The area around Raystown Lake boasts several including Rockhill Trolley Museum, Swigart Museum, and Isett Heritage Museum. Thankfully, the Army Corps of Engineers owns most of the land around the lake and doesnt allow private homes or cabins to b built near the shoreline. This has helped keep the lake beautiful and allows everyone to enjoy the lake and surrounding forest. Thank you Army Corps of Engineers!!!!!!!!!! Another amazing sight is 1000 Steps along 522 between Mt Union and Mapleton. It doesn’t overlook the lake but a must see! It’s a hike but beautiful. At one spot you can overlook the railroads and Juanita River…breathtaking! Spent many a day fishing right below the old dam and stayed in the old farmhouse that was there. Until very recently, I’ve had one at the bottom of every article. Unfortunately, changes at Google that have increased the cost of this to $800-1000 a month have made this a bit cost prohibitive. I’m looking at other options, though.